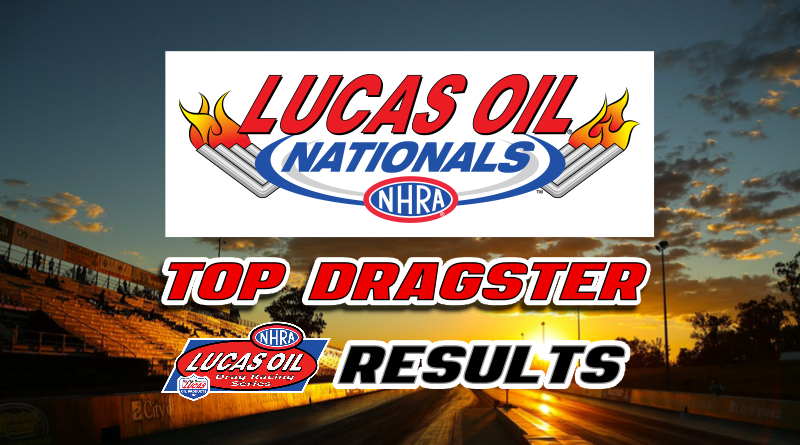 BRAINERD, Minn. – Canadian racer Todd Fleck, of Medicine Hat, AB., collected his first national event win at the 2018 NHRA Lucas Oil Nationals hosted by Brainerd International Raceway. Fleck defeated veteran Division 4 standout Ross Laris in the final when Laris’s transmission gave out on the starting line. Fleck was spectacular on the starting line throughout eliminations averaging a stellar .014 reaction time (excluding the semifinal where his opponent timed out). His 2014 American Race Cars built dragster was amazingly consistent as well which helped Fleck collect his first win. Fleck began eliminations with a red-light victory over Joe Hessling of APD Carburetor fame. Hessling missed the tree by just -.006 while Fleck made a great lap that consisted of a .011 reaction time and a -.004 under 7.386. Fleck’s paired against the 6.0, 225 mph dragster of No. 1 qualifier Scott Murray in the second round. Fleck squeaked by after taking a train length of stripe to run dead on with a one. Fleck left first with a .019 light followed by Murray’s .049. As they moved down track, Murray’s car slowed to a 6.21 on his 6.04 dial but with a 45 mph speed differential, Fleck drove it out the back door to take the stripe by two tenths, running a 7.391 on his 7.39 dial for the win. This win was pivotal in Fleck’s win as he received a bye in round three followed by two more freebies when third round opponent Matthew Kreft timed out at the starting line and final round opponent Ross Laris broke a transmission at the starting line. So after winning round two, Fleck ran basically uncontested to the title. Runner-up Ross Laris found himself in a familiar position on Sunday as he also made it to the final round the week prior at the Lucas Oil Drag Racing Series event held at the very same facility. Although Laris ended the back-to-back races with two runner-up finishes, it was an impressive effort none the less. Laris was just as impressive as event winner Fleck on the tree as he averaged a .010 light through the first four rounds of eliminations. Laris easily won his first round contest with Kendra Larson after he laid down .022 total. Laris paired a .005 reaction with a .017 over 6.197 (he pedaled at least once to kill .02) to take down Larson’s .054 package. Laris was stellar again in his round two matchup with Kenneth Moses. With a .013 to .039 reaction time advantage, Laris was able to kill .04 at the top end to take .020 at the finish line and post a .012 above 6.202 for the win. Moses ran dead-on his 6.67 dial in the losing effort. Laris had some luck of his own in his third round matchup with Clarence Mayo where he took the win by just .001 (a few inches). Laris once again won the reaction battle with his .006 easily handling Mayo’s .036. The real excitement came at the finish line as Laris pedaled to a .073 over 6.303 to take the stripe by one little thousandth. Mayo posted a .044 over 6.514 to come up .001 short in the losing effort. In the semifinals, Laris’s opponent, Daryl Forrest, gave him a huge gift when he turned it red by a ton. Forrest was -.499 which allowed Laris to coast to the finish line after his transmission broke on the run. Had Forrest not fouled, he most likely would have made it to the final round but in the end, Laris captured the win and headed to his sixth national event final round. The final was anticlimactic as Laris’s transmission broke again just after taking the green light. Fleck was stellar once again on the tree as he threw a .007 light at Laris and then cruised to a .015 over pass for the win. Fleck may have had some luck throughout the race but he also laid down impressive laps round after round to earn the Top Dragster Wally. Congratulations to Todd on his first national event win!